Menopause is the term used to indicate the end of the period of possible sexual reproduction, as evidenced by the cessation of menstrual periods. The word "menopause" literally means the "end of monthly cycles" from the Greek words pausis (cessation) and the word root men from mensis meaning (month). This usually occurs between 45 to 55 years. The menopausal transition starts with varying menstrual cycle length and ends with the final menstrual period. • Choose fresh foods over processed foods. • Have good amounts of fresh fruits and vegetables daily as they rich in vitamins, minerals and fiber. • Cut down on saturated fats like butter, cheese, ghee, junk and fried foods to avoid weight gain. • Go for whole grains like wheat, brown rice, jowar, ragi, bajra, whole wheat bread etc as having carbohydrates can ease mood swings and depression. 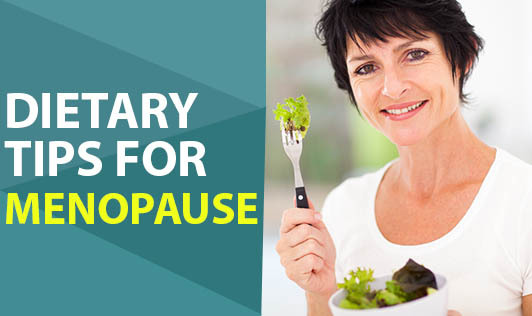 • Foods rich in omega 3 fatty acids like fish, nuts, rajma, flaxseed and soybeans would be good additions to a Menopause Diet. • Have skimmed milk and milk products, green leafy vegetables, ragi and other calcium-rich foods to reduce the risk of osteoporosis. • Go for grilled, broiled, steamed, stewed, baked or boiled foods instead of fried foods. • Eat fruit and nuts instead of high fat/high sugar desserts. • Soya and soya products are rich in phytoestrogens and they help in relieving hot flushes and night sweats. • Reduce the intake of tea, coffee, alcohol, spicy food to get some relief from hot flushes and night sweats.